The 110’ Broward IL CAPO was undoubtedly built to entertain, undergoing a major interior refit in 2016-17. 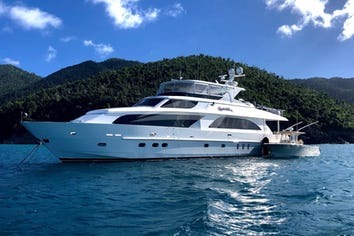 She features recent AV upgrades, paint, the latest water toys, as well as brand new soft goods and fine linens throughout. 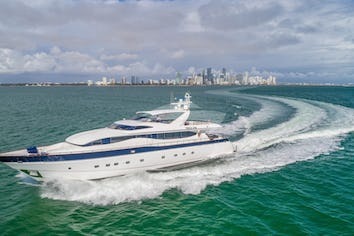 IL CAPO’s interior layout sleeps up to 8 guests in 4 staterooms, including a king master suite, 1 queen stateroom, a twin stateroom and a large, private VIP queen stateroom forward of the family country kitchen. 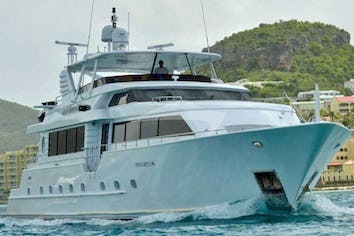 She also carries 4 crew comfortably onboard to ensure a relaxed luxury yachting experience.